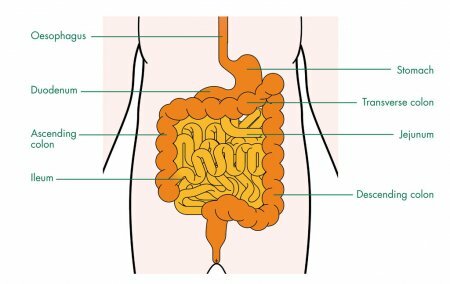 The small intestine is a long, highly convoluted tube in the digestive system that absorbs about 90% of the nutrients from the food we eat. It is given the name “small intestine” because it is only 1 inch in diameter, making it less than half the diameter of the large intestine. The small intestine is, however, about twice the length of the large intestine and usually measures about 10 feet in length. The small intestine winds throughout the abdominal cavity inferior to the stomach. Its many folds help it to pack all 10 feet of its length into such a small body cavity. A thin membrane known as the mesentery extends from the posterior body wall of the abdominal cavity to surround the small intestine and anchor it in place. Blood vessels, nerves, and lymphatic vessels pass through the mesentery to support the tissues of the small intestine and transport nutrients from food in the intestines to the rest of the body. - The duodenum is the first section of intestine that connects to the pyloric sphincter of the stomach. It is the shortest region of the small intestine, measuring only about 10 inches in length. Partially digested food, or chyme, from the stomach is mixed with bile from the liver and pancreatic juice from the pancreas to complete its digestion in the duodenum. - The jejunum is the middle section of the small intestine that serves as the primary site of nutrient absorption. It measures around 3 feet in length. - The ileum is the final section of the small intestine that empties into the large intestine via the ileocecal sphincter. The ileum is about 6 feet long and completes the absorption of nutrients that were missed in the jejunum. Like the rest of the gastrointestinal tract, the small intestine is made up of four layers of tissue. The mucosa forms the inner layer of epithelial tissue and is specialized for the absorption of nutrients from chyme. Deep to the mucosa is the submucosa layer that provides blood vessels, lymphatic vessels, and nerves to support the mucosa on the surface. Several layers of smooth muscle tissue form the muscularis layer that contracts and moves the small intestines. Finally, the serosa forms the outermost layer of epithelial tissue that is continuous with the mesentery and surrounds the intestines. The interior walls of the small intestine are tightly wrinkled into projections called circular folds that greatly increase their surface area. Microscopic examination of the mucosa reveals that the mucosal cells are organized into finger-like projections known as villi, which further increase the surface area. Each square inch of mucosa contains around 20,000 villi. The cells on the surface of the mucosa also contain finger-like projections of their cell membranes known as microvilli, which further increase the surface area of the small intestine. It is estimated that there are around 130 billion microvilli per square inch in the mucosa of the small intestine. All of these wrinkles and projections help to greatly increase the amount of contact between the cells of the mucosa and chyme to maximize the absorption of vital nutrients. The small intestine processes around 2 gallons of food, liquids, and digestive secretions every day. To ensure that the body receives enough nutrients from its food, the small intestine mixes the chyme using smooth muscle contractions called segmentations. Segmentation involves the mixing of chyme about 7 to 12 times per minute within a short segment of the small intestine so that chyme in the middle of the intestine is moved outward to the intestinal wall and contacts the mucosa. In the duodenum, segmentations help to mix chyme with bile and pancreatic juice to complete the chemical digestion of the chyme into its component nutrients. Villi and microvilli throughout the intestines sway back and forth during the segmentations to increase their contact with chyme and efficiently absorb nutrients. Once nutrients have been absorbed by the mucosa, they are passed on into tiny blood vessels and lymphatic vessels in the middle of the villi to exit through the mesentery. Fatty acids enter small lymphatic vessels called lacteals that carry them back to the blood supply. All other nutrients are carried through veins to the liver, where many nutrients are stored and converted into useful energy sources. Chyme is slowly passed through the small intestine by waves of smooth muscle contraction known as peristalsis. Peristalsis waves begin at the stomach and pass through the duodenum, jejunum, and finally the ileum. Each wave moves the chyme a short distance, so it takes many waves of peristalsis over several hours to move chyme to the end of the ileum.